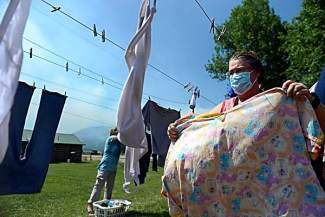 Extreme behavior stoked the West Fork Complex fire in southwestern Colorado Tuesday afternoon, with crowning fire sweeping through large stands of bug-killed timber. South Fork, Wagon Wheel Gap, and an area south of Creede on the south side of Colorado State Highway 149 remain under evacuation, and Creede is under a pre-evacuation notice, fire officials said. Trees and groups of trees are torching in the fire and there are crown runs, when fire jumps from tree top to tree top, as well.